Caveat: Some of the commentaries below have "jettisoned" a literal approach to the interpretation of Scripture and have "replaced" Israel with the Church, effectively taking God's promises given to the literal nation of Israel and "transferring" them to the Church. Be a Berean Acts 17:11-note! 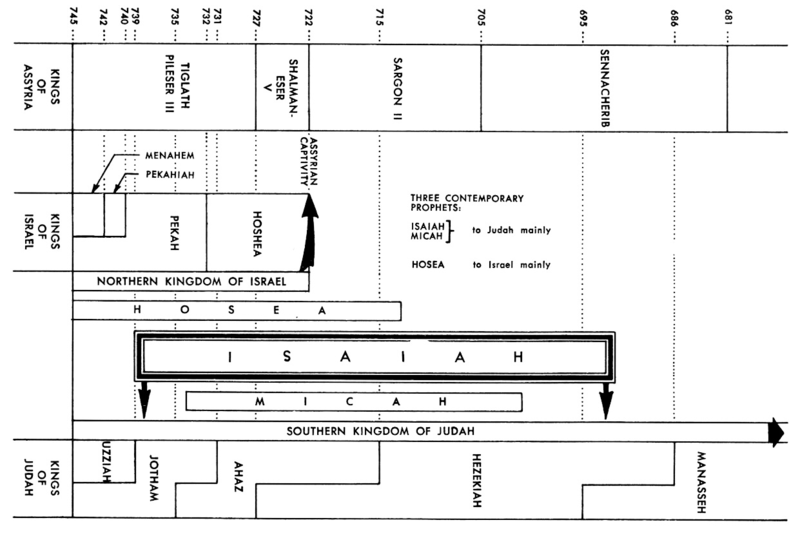 Introduction to Isaiah by Dr John MacArthur: Title, Author, Date, Background, Setting, Historical, Theological Themes, Interpretive Challenges, Outline by Chapter/Verse. Excellent overview same intro as in MacArthur Study Bible. Isaiah 34:1 Draw near, O nations, to hear; and listen, O peoples! Let the earth and all it contains hear, and the world and all that springs from it. KJV Isaiah 34:1 Come near, ye nations, to hear; and hearken, ye people: let the earth hear, and all that is therein; the world, and all things that come forth of it. As you read this next section keep in mind that Isaiah 34 and Isaiah 35 are a unit, the first chapter speaking of judgment against the enemies of Israel (represented by Edom) and the second chapter describing the glories of the restored nation of Israel in the Millennium. To help you put these chapters in context, notice from the charts above that Isaiah 34-35 ends the section which focuses primarily on judgment and is followed by the historical chapters, Isaiah 36-39, which in turn are followed by "comfort and redemption" chapters, Isaiah 40-66. ...a story in which people, things or happenings have a symbolic meaning. ...a story that can be interpreted to reveal a hidden meaning. ...a story in which the apparent meaning of the characters and events is used to symbolize a deeper moral or spiritual meaning. ...a symbolic story that serves as a disguised representation for meanings other than those indicated on the surface. Do you see the common thread of these definitions of allegory from multiple sources? The predominant idea is reading something and interpreting it as having a symbolic, hidden, deeper moral or spiritual meaning. Do you see the danger when one reads a prophecy like Isaiah with "allegorical glasses," so to speak, seeing virtually everything the prophet wrote as having a meaning other than that intended by God when He inspired the Jewish prophet's words to Jews? So from Isaiah's own words, to whom would you say Isaiah is writing this prophecy? To people in general? To the Church? If words mean anything, then clearly Isaiah is addressing his prophecy to Judah and Jerusalem. It is a Jewish prophet writing a Jewish Old Testament book to Jewish people! Could it be any clearer? And yet we come to Isaiah 34-35 and respected expositors such as Raymond Ortlund essentially disregard Isaiah's own words about who is his intended audience in the original historical setting. Some 15 times in Ortlund's introductory remarks he uses the word "US" (a "key word" in this section) and five times the word "OURSELVES", while using the word "ISRAEL" only five times. Ortlund's approach reminds me of a statement on Dr Michael Rydelnik's blog when he said "I once heard that every person is listening to the same radio station: WIIFM. That’s right, WIIFM. Those letters represent five words, What’s in it for me?" And so Dr Ortlund posits that in Isaiah 34-35 "Chapter 34 shows US what will become of everyone who buys into this world, and chapter 35 shows US what will become of everyone who banks everything on the promised salvation of God." While there is a ring of truth about what Ortlund says, it is clear from his introduction that he is skipping over the literal observation of the text and focusing primarily on application of the text to saints today. In so doing he completely misses the accurate interpretation of Isaiah's words, for as any good inductive Bible study student knows careful observation is critical to accurate interpretation. Beloved, there is only one valid interpretation of any text (and granted in a number of texts God's intended meaning can be very difficult to determine), but that same text can have many applications. Ortlund focuses on the latter, but does so without first gleaning an accurate interpretation. Paul instructed Timothy and all of us who handle God's Word to be "Be diligent to (aorist imperative - Command. Do this now! Don't delay! It is urgent so that you might) present yourself approved to God as a workman who does not need to be ashamed, accurately handling the Word of truth." (2 Timothy 2:15-note). As someone has well said "Rightly dividing the Word multiplies our understanding!" Isaiah's radio station call letters instead of "WIIFM" are more accurately abbreviated "WIIFI," "What's In It For Israel?" To further support my premise that Ortlund essentially ignores that these words were written to Jews by a Jewish prophet, notice his very nice outline which has not one mention of the Jews! Ortlund goes on to give an illustration from the life of Lance Armstrong "a great athlete...we all admire him," quoting him as saying " I believed I had a responsibility to be a good person, and that meant fair, honest, hardworking, and honorable. If I did that, if I was good to my family, true to my friends, if I gave back to my community or to some cause, if I wasn’t a liar, a cheat, or a thief, then I believed that should be enough. At the end of the day, if there was indeed some Body or presence standing there to judge me, I hope I would be judged on whether I had lived a true life, not on whether I believed in a certain book, or whether I’d been baptized. If there was indeed a God at the end of my days, I hoped he didn’t say, “But you were never a Christian, so you’re going the other way from heaven.” If so, I was going to reply, “You know what? You’re right. Fine.”" Clearly this was quoted before the truth came out that Armstrong was "a liar, a cheat...a thief." Ortlund then follows with his conclusion on Isaiah 34 - "Do we know who we are? Do we know who God is? Nobody will get the last word in on God.“The good life” turning into an eternally barren desert—that is where God-neglect takes us (Isaiah 34). But if you will put your trust in God, your desert will be transformed into a garden. That is what the grace of God can do (Isaiah 35). Each one of us is moving in one of these two directions, either into judgment or into salvation. What God wants is to save you." Beautifully written words, all true by way of application, but words that essentially jettison accurate interpretation! In sum, Ortlund's comments might be helpful to a preacher in applying Isaiah 34-35 to the real lives of his congregation. But beloved, if you miss Israel in the OT, you miss one of God's keys to interpreting all of Biblical prophecy, for as someone has said "Israel is 'God's Timepiece.'" Keep your eye on Israel in the Bible and God's Plan for the Ages will beautifully unfold from Genesis to Revelation. Replace Israel with the Church and Biblical prophecy becomes hopelessly mired in confusion and is virtually uninterpretable! And what is one result of this confusion? Many churches shy away from preaching prophetic passages (Excuses I have heard include - "There's too much disagreement," "Prophecy is not practical or applicable to real life," "Who knows which interpretation is correct? ", etc) which is tragic since 25% of Scripture was recorded originally as prophecy and 80% has been perfectly fulfilled leaving 20% which will be perfectly fulfilled! It follows that sadly many saints in the modern church are virtually completely ignorant concerning the remaining 20%! I want to emphasize that I have nothing personal against Dr Ortlund whose writing style is very poetic and beautiful and is filled with application. But because it is so excellent, one can read a prophecy like Isaiah 34-35 and pay more attention to Ortlund than to Isaiah and go home after the sermon or reading a chapter of his book and not have a clue about what Isaiah was actually talking about or to whom he was originally speaking! I have given such a lengthy critique of Ortlund's discussion (from his highly rated Preaching the Word: Isaiah - God Saves Sinners - 4.5 stars - see the reviews!) because he is representative of many of the commentaries on the Book of Isaiah that fail to read and interpret the text literally, but instead choose to spiritualize or allegorize the text and in so doing in essence replace Israel with the Church (See replacement theology / supersessionism a "doctrine" which smacks of subtle Anti-Semitism). For more on how this genre of "interpretation" has become very popular in our time, read Dr Anthony Garland's discussion on the Rise of Allegorical Interpretation. Draw near, O nations, to hear; and listen, O peoples! - The nations of the world are called to "stand" before the bar of justice (so to speak) of the Judge of "the living and the dead" (2 Ti 4:1-note) and hear His verdict and the sentence they will receive in the verses that follow. This is a prophecy of a terrifying future event and God is calling all mankind to listen to this message. You may say that this is future to me, so it does not apply to me. If you are not a believer in Messiah, than it applies to you. Yes, you may not be on earth when these terrifying events take place, but you will be judged by a far more terrifying event and that is the Great White Throne judgment (Rev 20:11-15) and receive God's guilty verdict and incur His righteous indignation and wrath which will be meted out on you personally for all eternity in the Lake of fire (See discussion of eternal punishment). And so it is imperative that you draw near and that you listen to what Isaiah prophesies. David Thompson - When you look at Isaiah 34:1, it becomes very clear that God calls “all” the nations in the world to carefully listen to and understand the book of Isaiah. In this text, God transports the entire world into the future and gives them a glimpse of what will take place. There is a famous battle described in Revelation, called the battle (ED: BETTER = CAMPAIGN) of Armageddon (Revelation 19:11-21), in which God totally demolishes all world powers who have dared come against Israel. That very battle is seen here by Isaiah. Isaiah 34:2 For the LORD'S indignation is against all the nations, and His wrath against all their armies; He has utterly destroyed them, He has given them over to slaughter. KJV Isaiah 34:2 For the indignation of the LORD is upon all nations, and his fury upon all their armies: he hath utterly destroyed them, he hath delivered them to the slaughter. For - This is a strategic term of explanation - Consider the "5P's" - Pause to Ponder the Passage then Practice it in the Power of the Spirit. What has Isaiah just commanded and to whom in Isaiah 34:2? Isaiah is giving the reason for the previous call to draw near and listen. S. Lewis Johnson: And so here in the chapters that have preceded chapters 28 through 33 of the Prophecy of Isaiah have been woes upon the nation and upon the nations, and now these woes upon the nation and the nations that Isaiah knew merge into this grand apocalyptic finale of the end of all things, and so the prophet’s view point moves from the present and the background of his own time on to the end of the age and the second advent and kingdom of God. In other words, just as in the earlier section, messiah and the lineaments of his personal character form the promise section, so in the latter part it is the coming of the messiah to the earth that is designed to stir the hearts of Isaiah’s readers. Oswalt: The text focuses on what God will do, not on why God will act in this way. God’s actions should not be interpreted as uncontrollable emotional outbursts of inappropriate rage, but as the natural response of a holy God to sin. By these acts he will justly punish wicked people and establish his righteous dominion over the world by removing the ungodly. The LORD'S indignation is against all the nations - This clearly speaks of divine justice to be meted out in the Day of the LORD, especially during the horrible time of the tribulation when the "Bowl Judgments" of God will be poured out on the God-hating earth dwellers (not just those who live on the earth but specifically that subset that is intractably, irrevocably opposed to the rule of God in their lives). The Septuagint translates against twice with the preposition "epi-" which means upon, which gives us an apropos picture of God's wrath being poured out UPON the godless nations and their armies. And His wrath against all their armies - When will this indignation and wrath be poured out? In the latter part of the Great Tribulation, the last of the last days of this present evil age (Gal 1:4-note), in the time referred to frequently in Scripture as the Day of the LORD. Comment: Zechariah gives us a detail of these end time events not seen in Isaiah, Joel or Revelation and that detail is that at first the battle looks bad for the nation of Israel (and Jerusalem), but just when it looks like all is lost, Messiah will go forth and fight against those nations (see description of this battle below in Revelation 19:15-21). Wrath (anger, fury, venom, hot-tempered) (02534)(chemah from yacham = to be hot, Delitzsch says it is related to an Arabic word hamiy = to glow) is a noun which can refer to physical heat, but more often is used figuratively to convey the picture of inner, emotional "heat" which rises and is fanned to varying degrees. And thus chemah can mean hot displeasure, indignation, anger, wrath, and even poison (figuratively speaking). This type of anger is anger at its fever pitch so to speak. He has utterly destroyed them, He has given them over to slaughter - Notice the use of the past tense not the future tense. So certain is the destruction of the armies of the nations of the world by Messiah, that Isaiah speaks as if it were already fulfilled. God's Word is a sure Word whether it be prophecy or promise and is sure to be fulfilled in His perfect timing! Moody Bible Commentary - The term translated utterly destroyed is used in several places throughout the OT to refer to the “ban,” or the setting aside of something or someone for total destruction (Nu 21:2–3; Dt 2:34; 3:6; Josh 6:18, 21; 11:11–12, 20). The use in Isa 34:2 underscores the severity of God’s punishment of the nations. Thompson on utterly destroy "means God has made a contract with Himself to totally, utterly and completely destroy the nations of the world. He has a sacred, consecrated plan that He will devote Himself to and that plan is the total and complete destruction of the nations." Fruchtenbaum comments on a distance of 200 miles - The blood stretches for 1,600 furlongs, which is approximately two hundred miles. The two hundred miles may refer to the entire area from the Valley of Armageddon to Bozrah, which is about two hundred miles. 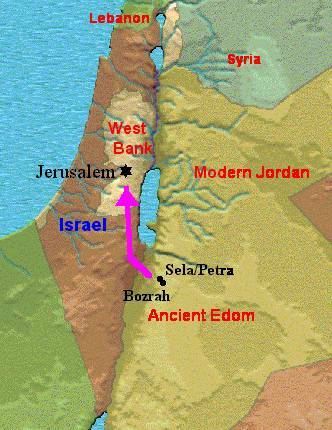 Another possible explanation is that it refers to the round trip distance between Jerusalem and Bozrah (see map below). The fighting will begin in Jerusalem and move to Bozrah (100 miles), and with the Second Coming, will return back from Bozrah to the Valley of Jehoshaphat (another 100 miles). But the best explanation is based on Jeremiah 49:20-22 . . . In the context (see Jer. 49:13-14), this passage is dealing with the Campaign of Armageddon. The massive blood-letting that begins at Bozrah begins moving south down the Arabah until it empties in the Red Sea at the present-day cities of Eilat and Akaba. The distance from there to Jerusalem is about two hundred miles. D G Barnhouse - Armageddon is in the north of Palestine [Rev. 16:14-16], the valley of Jehoshaphat is in the south. Bozrah is named by Isaiah as the place where the Lord treads the winepress [Isa. 63:1-6-note]. And the distance between the farthest points of this “front” is 1600 furlongs. Walter Scott - What is signified is a vast destruction of human life over a circumscribed area. Certainly what is stated of the vast slaughter is beyond anything ever known. The Lxx translates tebach in this verse with sphage which is the same noun used in Lxx of Isaiah 53:7 "Like a lamb that is led to slaughter (Heb = tebach; Lxx = sphage). Tebach - 12v - animal(1), food(1), slaughter(10). John MacArthur comments that "The prophet, one final time, cycles back over the judgment that precedes the (ESTABLISHMENT OF THE MILLENNIAL) kingdom. God will strike the heathen forces gathered against Israel (Zech 14:1–3-note) with a supernatural plague similar to His judgment of the Assyrian army (Is 37:36), causing a panic so great that they begin to attack one another (cf. Jdg 7:22; 1Sa 14:15–20; 2Ch 20:23), aiding in the escape of the half (cf. Zech 14:2-note, Zech 14:5-note). God will enable His people to fight (cf. Isaiah 11:13, 14-note). Then He will send a widespread plague that even extends to their animals, preventing their use for military endeavors or escape. This depicts the thwarting of their efforts as God ultimately destroys them by the Messiah (Rev 19:11–16-note)." Isaiah 34:3 So their slain will be thrown out, And their corpses will give off their stench, And the mountains will be drenched with their blood. KJV Isaiah 34:3 Their slain also shall be cast out, and their stink shall come up out of their carcases, and the mountains shall be melted with their blood. Keil and Delitzsch - The nations that are hostile to Jehovah are slaughtered, the bodies remain unburied, and the streams of blood loosen the firm masses of the mountains, so that they melt away. On the stench of the corpses, compare Ezek. 39:11-note. Oswalt - The sickening scene pictures death everywhere, the horrible stench of rotting flesh, and blood flowing like water all over the land. This is a ghastly picture of horror from the destruction of millions of people on the earth. Motyer - God does certainly hate the sin and love the sinner, but if the sinners refuse the ‘gospel call’ they suffer the penalty of their sin and the distinction between sin and sinner breaks down. And the mountains will be drenched with their blood - Literally the text reads ""hills will dissolve from their blood." This is a difficult phrase. NET = " the hills will soak up their blood" ESV (NLT) = " the mountains shall flow with their blood. " Moody Bible Commentary - The translation the mountains will be drenched with their blood (v. 3) is somewhat misleading. The term translated drenched is used in other contexts to denote melting or dissolution. There are several figurative references to “hearts melting” (Dt 20:8; Jos 2:11; 5:1; 7:5; 2 Sam 17:10; Ps 22:14; Is 13:7; 19:1; Ezek 21:12), as well as several uses in which the melting of material is in view (Ex 16:21; Jdg 15:14; Ps 68:3). The term is also used to describe the melting away of the mountains in Ps 97:5 and Mic 1:4. While there is no reference to blood in either Ps 97:5 or Mic 1:4, it is clear in both passages that the mountains are “melting away.” As such, the translation of Is 34:3 should likely be understood as “the mountains will melt with the blood.” Oswalt suggests that the image is drawing on the erosion that takes place as water dissolves soil (Oswalt, Isaiah 1–39, 609). This understanding also fits well with the dissolution of the stars, or hosts, of heaven in Isaiah 34:4. In each case, it is clear that God is giving the nations an idea of His sovereign, cosmic reach. Motyer on mountains drenched with their blood, says "drenched" is "literally ‘melted’ by a new and dreadful soil erosion through the torrential blood of the slain." See preceding note on slaughter for John's description of this incredible end-time slaughter and blood-letting. KJV Isaiah 34:4 And all the host of heaven shall be dissolved, and the heavens shall be rolled together as a scroll: and all their host shall fall down, as the leaf falleth off from the vine, and as a falling fig from the fig tree. ESV Isaiah 34:4 All the host of heaven shall rot away, and the skies roll up like a scroll. All their host shall fall, as leaves fall from the vine, like leaves falling from the fig tree. LXE (Septuagint) Isaiah 34:4 And all the powers of the heavens shall melt, and the sky shall be rolled up like a scroll: and all the stars shall fall like leaves from a vine, and as leaves fall from a fig-tree. NLT Isaiah 34:4 The heavens above will melt away and disappear like a rolled-up scroll. The stars will fall from the sky like withered leaves from a grapevine, or shriveled figs from a fig tree. NIV Isaiah 34:4 All the stars of the heavens will be dissolved and the sky rolled up like a scroll; all the starry host will fall like withered leaves from the vine, like shriveled figs from the fig tree. And all the host of heaven will wear away, And the sky will be rolled up like a scroll - It is noteworthy that even the created heavens and heavenly bodies will be impacted by the indignation and wrath Jehovah pours out on earth for in a way we cannot now fully understand the whole cosmos has been infected with human sin. Revelation 6:12-14-note I looked when He (THE LAMB) broke the sixth seal, and there was a great earthquake; and the sun became black as sackcloth made of hair, and the whole moon became like blood; 13 and the stars of the sky fell to the earth, as a fig tree casts its unripe figs when shaken by a great wind. 14 The sky was split apart like a scroll when it is rolled up, and every mountain and island were moved out of their places. Whether these cosmic disturbances occur earlier with the breaking of the Sixth Seal or later associated with the pouring out of Sixth Bowl (Rev 16:12-16) (or after this bowl which is associated with the gathering of the nations at Armageddon), the chaos in the creation will alert every person on earth that the Creator is in total control and fully able to fulfill the outpouring of indignation and wrath described in Isaiah 34:2-3. Oswalt adds that "The collapse of the heavenly world involves a reversal of God’s creative establishment of the heavens. At creation he spread out the heavens like a tent cloth (Isa 40:22), but in the future just the opposite will happen when God rolls it up like a scroll. He will reverse the creation by rolling his cloth back up and dimming the bright objects of light in the heavens. Instead of being a vital part of the world, the stars of the sky will fall from the heavens like dead leaves falling from a tree. When the power of God’s destructive wrath brings the mighty heavens and its hosts down to the realm of a puny dead leaf falling from a tree, one begins to glimpse the enormity of what God will do. Such comparisons should produce awe and amazement in the hearts of mankind. When people think about the stark reality of the sovereign power of God actively establishing his just rule over all the heavens and the earth, people should be humbled and thoroughly convinced that they do not want to arouse the power of God’s wrath or experience the destruction that he will accomplish." Joel 2:30; 31-note “I will display wonders in the sky and on the earth, Blood, fire and columns of smoke. 31 “The sun will be turned into darkness And the moon into blood Before the great and awesome Day of the LORD comes. Joel 3:15-17-note (see this note for similar cross references to cosmic chaos in the end times) The sun and moon grow dark And the stars lose their brightness. 16 The LORD roars from Zion (cf His Second Coming in Revelation 19:11-21-note) And utters His voice from Jerusalem, And the heavens and the earth tremble. But the LORD is a refuge for His people And a stronghold to the sons of Israel. 17 Then (WHEN? WHEN HE RETURNS AND SLAUGHTERS ISRAEL'S ENEMIES - cf Zech 14:3-note) you (ISRAEL - THE REDEEMED REMNANT WHOSE EYES HAVE BEEN OPENED BY THE SPIRIT [cf Zech 12:10-note, Zech 13:1-note, Zech 13:8-9-note] TO SEE BY FAITH AND TRUTH KNOW BY EXPERIENCE THEIR MESSIAH) will know that I am the LORD your God, Dwelling in Zion, My holy mountain. So Jerusalem will be holy (cf the "highway of holiness" = Isaiah 35:8-note, cf Zech 14:20-21-note) , and strangers will pass through it no more. All their hosts will also wither away As a leaf withers from the vine, Or as one withers from the fig tree. (ESV = All their host shall fall, as leaves fall from the vine, like leaves falling from the fig tree; NLT = The stars will fall from the sky like withered leaves from a grapevine, or shriveled figs from a fig tree; NIV = all the starry host will fall like withered leaves from the vine, like shriveled figs from the fig tree. NET Note - the "host of the heaven" refers to the heavenly luminaries (stars and planets, see, among others, Deut 4:19; 17:3; 2 Kgs 17:16 ; 21:3, 5; 23:4–5; 2 Chr 33:3, 5) that populate the divine/heavenly assembly in mythological and prescientific Israelite thought (see Job 38:7; Isa 14:13). As in 24:21, they are viewed here as opposing God and being defeated in battle. For My sword is satiated in heaven - Satiated means saturated. NLT = when my sword has finished its work in the heavens; CSB = When My sword has drunk its fill in the heavens. (Revelation 1:16-note) In His right hand He held seven stars, and out of His mouth came a sharp two-edged sword; and His face was like the sun shining in its strength. (Revelation 19:15-note) (THE CONTEXT IS HIS SECOND COMING TO BRING JUDGMENT ON HIS ENEMIES) From His mouth comes a sharp sword, so that with it He may strike down the nations, and He will rule them with a rod of iron; and He treads the wine press of the fierce wrath of God, the Almighty. Oswalt on My sword is satiated in heaven - The idea of a sword that has “drunk its full” (Ed: The Lxx translates satiated with methusko = to cause to become intoxicated) is an image of an instrument of death saturated from killing its victims. After wielding its destructive power in the heavens, this sword will descend to earth on the representative nation of Edom. McGee comments - God bathes that sword in heaven—that is important to see. When you and I take the sword down here, it is for vengeance or some ulterior motive. When God takes the sword, it is for justice and righteousness upon the earth. His sword is bathed in heaven, and it is going to fall in judgment. Idumea (Isa 34:5KJV) is Edom, and Edom is Esau, and Esau represents the flesh. Esau represents all in Adam who are rebellious against God and His people. God said, “…Jacob have I loved, but Esau have I hated” (Ro 9:13). God will judge Edom because they are against God, against His people, against His Word, against everything that is right and good. Bultema - Edom was a sister nation to Israel, but it hated Israel more than any other nation. Throughout all of history we see a burning hatred of Edom against Israel. It is for this reason that Edom is frequently presented as a representative of all the nations that hated the Jews. Wolf - Edom had derided and attacked Judah for centuries, but now God would avenge this hateful attitude that is so characteristic of the world’s ways. Behold it shall descend for judgment upon Edom - The sword of Yahweh will fall on Edom, who most interpreters feel is singled out as representative of all the nations of the world which were intractable enemies of God's people (e.g., look at the United Nations condemnation of President Trump's decision to move the U S Embassy from Tel Aviv to Jerusalem!). Judgment (justice) (04941)(mishpat/mispat from shaphat = to judge, govern) is a masculine noun used over 400x in the OT and has general meanings including a judgment, a legal decision, a legal case, a claim, proper, rectitude. MacArthur notes that "The prophet selects Edom as a representative of the rest of the nations (cf. Isaiah 63:1; Ge 25:23; Nu 20:14–21; Eze 35:1–15; Ob 1–14; Mal 1:2, 3; cf. Isa 25:10)"
Oswalt: The Sovereign of the universe has commanded this desolation and he will bring it to pass. Just as he sovereignly apportioned Canaan to his people Israel, so he has apportioned the Edoms of this world to the birds of the desert. No nation or people are able to choose their destiny without regard to their own behavior. Rather, by its behavior it earns a destiny in keeping with God’s immutable character. So again Isaiah asks, “Why trust the nations? They are not masters of their own destiny. Rather, they belong to God who, like the landowner, can use a string to divide them into plots of his own choosing” (cf. Ps. 16:6; Mic. 2:5). And upon the people whom I have devoted to destruction - (NET Note = I will annihilate in judgment. "; NIV - the people I have totally destroyed; CSB = on the people I have set apart for destruction) So in this passage we see the judgment is on Edom but also upon the people who God has set apart to be totally destroyed. There will "Multitudes, Multitudes in the Valley of Decision," millions and millions of earth dwellers who gather to battle Jehovah. There will be so many bodies, they cannot even be buried and thus the stench from their rotting corpses which Isaiah described earlier (Isaiah 34:3-note). See - What did it mean to be devoted to destruction? Isaiah 34:6 The sword of the LORD is filled with blood, It is sated with fat, with the blood of lambs and goats, With the fat of the kidneys of rams. For the LORD has a sacrifice in Bozrah And a great slaughter in the land of Edom. KJV Isaiah 34:6 The sword of the LORD is filled with blood, it is made fat with fatness, and with the blood of lambs and goats, with the fat of the kidneys of rams: for the LORD hath a sacrifice in Bozrah, and a great slaughter in the land of Idumea. Constable adds that "Using sacrificial imagery, the Lord in judgment will seek what is peculiarly his. He will take what He alone has a right to take. Sin is a matter of life and death. All sin must be atoned for with sacrificial blood (cf. Lev. 4:1–12; Isa. 53). Those who repudiate the sacrifice of Christ for their sins will forfeit their own lives as sacrifices to God. A sacrifice is necessary, therefore, third, if the demands of divine holiness are to be met. No rebel would be spared." Motyer on fat...blood - (These) were the parts of the slaughtered beast that belonged only to God (Lev. 3:16–17; 7:23–27). In judgment the Lord seeks what is peculiarly his, that to which he alone has a right. The sword of the LORD is filled with blood, It is sated with fat, with the blood of lambs and goats, With the fat of the kidneys of rams - Using the language of Israel's sacrificial system, it pictures Jehovah slaughtering the animals (who stand for slaughtering of people beginning in Bozrah and Edom - see below for proposed sequence of Campaign of Armageddon). The phrase the sword of the LORD is filled with blood will find its fulfillment in the final battle of the Campaign of Armageddon when the blood will come up to the horses' bridles (Rev 14:20). For the LORD has a sacrifice in Bozrah - Bozrah was 27 miles south of the Dead Sea and was the capital of Edom. Moody Bible Commentary on Bozrah - Others maintain that Bozrah should be located in the ancient Nabatean stronghold of Petra. This is an isolated area, accessible via a narrow canyon that opens into a wide space. This seems the more likely location because: (1) The name “Bozrah” means “sheepfold” and the city of Petra is located in a basin within Mt. Seir with surrounding mountains and cliffs, creating a natural “sheepfold.” (2) Right next to Petra is the Arab site of Butzeira, a name that more accurately retains the Hebrew form of Bozrah. Some have conjectured that Bozrah is the place to which Jewish people in the future tribulation will flee for safety from the pursuit of the Antichrist (see Rev 12:6-note). Therefore it would make sense for end-time judgment to begin with the Lord’s deliverance of the Jewish people there. Guzik comments that "In associating this time of judgment with the image of sacrifice, Isaiah tells us that this is payment for the penalty of sin. Even as a sacrificial victim paid for the sin of the one bringing the sacrifice, so the bloody judgment of sin at Armageddon will be a payment for the penalty of sin. It will be an imperfect, incomplete payment, but it will be a payment of some kind." Keil and Delitzsch - Just as in Isa 63:1-6 Jehovah (JESUS) is represented as a treader of the wine-press, and the nations as the grapes; so here He is represented as offering sacrifice, and the nations as the animals offered (zebhach: cf., Zeph. 1:7; Jer. 46:10); Ezek. 39:17ff. : all three passages founded upon this). Sacrifice (02077)(zebah) from zabah - to slaughter for sacrifice) refers to an offering killed and presented by the worshiper to God as an act of devotion (to fill a special vow - Nu 15:3), thanksgiving (Lev 22:29, Ps 107:22, 116:17) or to meet the need for forgiveness (expiation, propitiation). ESV Study Bible on slaughter - The world becomes a bloody altar as God requires payment for sin (the only refuge for anyone is the sacrifice of Christ). And a great slaughter in the land of Edom - Gary Smith writes that "God drops the sword images and focuses on analogies related to the killing of animals prepared for slaughter or sacrifice (cf. 25:6; 30:32; Jer 46:10; Ezek 39:17). Ideas of confession of sin, substitution, atonement, and forgiveness of sin that are associated with sacrifices in Leviticus are missing from this discussion, for the focus draws an analogy with the slaughter of animals, not the atonement of sins. The specification of Edom and Bozrah (the capital of Edom) is not because the Edomites were especially sinful or violent; they merely represent what God will destroy (cf. 63:1–6). Cities like Bozrah, a very secure Edomite fortification, will not stand. People who act like the Edomites will be destined for slaughter." Ironsides - God declared that He would cut off the people of Edom (Obadiah 18); and in the last days there will be a people in the land of Idumea where once the Dukes of Edom reigned, whose envy of and hatred toward the sons of Jacob will be as great as that of the Edomites of old. Upon these, unsparing judgment will fall. The sword of the Lord will be drawn out from its sheath and will not be returned to the scabbard until all the enemies of Israel will be blotted out. This will be the day of the Lord’s recompense for all the sufferings that have fallen upon Zion and the people represented by that city throughout the centuries that have gone since they were scattered among the Gentiles, because they knew not the time of their visitation. 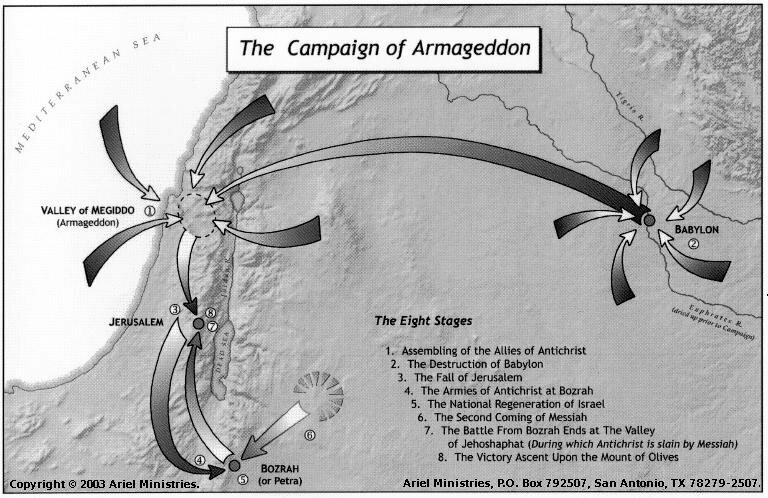 Arnold Fruchtenbaum offers the following sequence of events in the Campaign of Armageddon - NOTE - the links labeled "note" are on site in depth commentary on the respective passage. 1. The Assembling of the Allies of Antichrist - When the sixth bowl is poured out, the Euphrates river is dried up and the kings of the earth are gathered to the valley of Jezreel (Rev. 16:12-16-note; Joel 3:9-11-note). 2 The Destruction of Babylon - Babylon is rebuilt on the banks of the Euphrates to become the world economic capital (Zec. 5:5-11). While the Antichrist is away at Megiddo, Babylon undergoes catastrophic destruction (Isa. 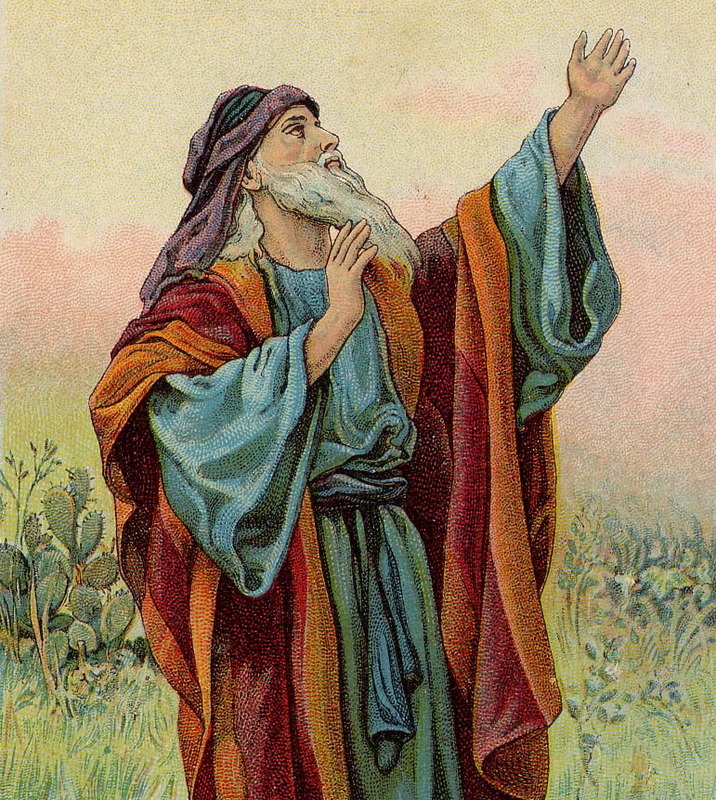 13-note, Isaiah 14; Jer. 50, 51; Rev. 15:8-note; Rev 17:18-note; Rev 18:1ff-note; Rev 19:2-note). 3. The Fall of Jerusalem - The Antichrist receives news that his capital city has been destroyed and moves south against Jerusalem (Zec. 12:1-3-note; Zech 14:1-9-note; Micah 4:11-5:1-note). The Jews will put up a mighty defense, but Jerusalem will eventually fall (Zec. 14:2-note). 4. The Armies of the Antichrist at Bozrah - The Jewish remnant flees to the mountains (Mt 24:15-note) and then to the wilderness in Edom (see Sheep in Bozrah). The armies under Antichrist will move against the Jews in Bozrah (Micah 2:12-note). 5. The National Regeneration of Israel - The Jews confess their national sin, the rejection and crucifixion of Messiah Jesus (Lev. 26:40-42-note; Jer. 3:11-18; Hos. 5:15). They then plead for His return (Ps. 79:1-13; Isa. 64:1-12; Hos. 6:1-3; Zec. 12:10-14-note; Zech 13:1-note; Zech 13:7-9-note; Mt. 23:39). 6. The Second Coming of Messiah - Christ returns to Bozrah, where the remnant have been preserved (Isa. 34:1-7; Isa. 63:1-6-note See in depth commentary; Mic. 2:12-13-note; Hab. 3:1-19-note; Zec. 12:7-note; Rev. 19:11-18-note). 7. The Battle from Bozrah to the Valley of Jehoshaphat - Christ fights the forces of Antichrist from Bozrah continuing all the way back to the eastern walls of Jerusalem, which overlook a section of the Kidron Valley, also known as the Valley of Jehoshaphat. Antichrist is destroyed. (Joel 3:2-note, Joel 3:12-13-note; 2Th. 2:8; Zec. 14:12-15-note; Rev. 14:19-20-note; Rev 19:20-note). 8. The Victory Ascent Up the Mount of Olives - This is not the initial return of Christ, for He will save the tents of Judah first (Zec. 12:7-note). Nor will his initial return be to the same place He ascended, the Mount of Olives, but merely in the same manner (Acts 1:11 = "will come in just the same way as you have watched Him go into heaven"). His ascent to the Mount is attended by cataclysmic events associated with the seventh bowl judgment (M 24:29-note; Zec 14:4-5-note; Rev. 16:17-21-note). 1. Covenant with Antichrist - Prince of Roman empire [the Antichrist] makes a covenant with Israel for a seven year period (Da 9:26-27-note). (Although this covenant is broken three and one-half years later.) See Events of the 70th Week of Daniel. 2. Invasion of Palestine - The King of the North and the King of the South invade Palestine (Da 11:40-note). 3. Antichrist Responds - Because of his covenant with Israel, the Antichrist will come to Israel’s defense (Da 11:40-45-note). 5.Headquarters in Palestine - The Antichrist moves his headquarters into the land of Palestine and assembles his armies there (Da 11:45-note). 6. Christ Returns - Before he can engage the kings from the east, Christ returns. All the armies combine to fight against God (Rev. 19:19-note). 7. Antichrist and Armies Overthrown - The armies and the Antichrist are destroyed without human means (Da 9:25-note; Da 11:45-note; Rev. 19:20-note). Here is another proposed sequence of events related to the Campaign of Har-Magedon. While this sequence can be "authenticated" from Scripture, it is merely a proposal and not a meant to be a definitive description of the cataclysmic end times events. 3). The armies in #1 invade and conquer Jerusalem, but they know that there are still a remnant of Jews that have fled into the wilderness (Rev 12:6, 13-17 where the "woman" = Israel). (Zechariah 12:1-14:21 is a "unit" which describes the capturing of Jerusalem, but then the final triumph of the Messiah). 5). John describes Jesus' triumphant return in Rev 19:11-16. But to where does the Lord return? Isaiah 63:1-6 (See in depth commentary) supports the premise that Messiah returns first to the area of Edom whose capital city was Bozrah. 6). As Christ returns to Edom, the Antichrist's armies approach from Jerusalem. The Messiah victoriously treads down His foes and marches straight through them northward, His garments becoming soaked with their blood that rises as high as the bridle on the horses for 200 miles (Rev 14:20). Note that several passages support the premise that when Christ returns, He first comes to the region of Edom. (c) Habakkuk 3:3-note - God comes from Teman (Edom), and the Holy One from Mount Paran. Selah. His splendor covers the heavens, and the earth is full of His praise. In addition Messiah makes a Highway of holiness (Isaiah 35:8) on which the redeemed follow Him in His triumph. 7). Christ comes up to the Valley of Jehoshaphat, the Valley of Decision, where the nations have been gathered (Joel 3:2, 12-14) and He walks up to the Mount of Olives and stands on the Mount (Zechariah 14:1-4) as KING OF KINGS AND LORD OF LORDS AND VERY GOD OF VERY GOD. And when He does all the nations that are in the Valley of Jehoshaphat are judged by Christ, Who separates the sheep from the goats. All of those who have not received the MARK OF THE BEAST and have taken care of His brethren, the Jews, will enter into His kingdom, but the goats who have not will be cast directly, immediately into the Lake of Fire. Isaiah 34:7 Wild oxen will also fall with them And young bulls with strong ones; Thus their land will be soaked with blood, And their dust become greasy with fat. KJV Isaiah 34:7 And the unicorns shall come down with them, and the bullocks with the bulls; and their land shall be soaked with blood, and their dust made fat with fatness. MacArthur has an interesting interpretation - Since the nations had not repented and obeyed God’s way of sacrifice for sins, they became the sacrificial penalty for their own sins. Gotquestions on wild oxen translated in KJV as Unicorns - Hebrew word re'em, signifies a horned animal similar to the aurochs, a now-extinct ancestor of today’s domestic cattle. For some unknown reason, the translators of the KJV chose to substitute “unicorn” for the name of this horned animal each time it occurred: e.g., Deuteronomy 33:17; Psalm 22:21; and Isaiah 34:7. The Bible, in its original languages, never actually mentions unicorns. Thus their land will be soaked with blood, And their dust become greasy with fat. Isaiah 34:8 For the LORD has a day of vengeance, A year of recompense for the cause of Zion. KJV Isaiah 34:8 For it is the day of the LORD'S vengeance, and the year of recompences for the controversy of Zion. The LORD has a day of vengeance - Jehovah has a day on His calendar and it is the day of Jehovah's revenge. Vengeance means the act of taking revenge or inflicting harm on someone in retaliation for something harmful that they have done. Comment - The first clause (day of vengeance) parallels Isaiah 34, while the second clause (year of redemption) parallels the truths in Isaiah 35. Vengeance (05359)(naqam from the verb form naqam = to avenge or take vengeance) is the act of taking revenge (harming someone in retaliation for something harmful that they have done). It refers to punishment inflicted or retribution exacted for an injury or wrong and can refer to punishment beyond what is physical. MacArthur - God’s day of vengeance on Edom (Isa 63:4-note) will be the same as on the rest of the nations (Isa 59:17, 18; 61:2). Wiersbe - God sees His enemies as animals: Rams, goats, lambs, oxen, and bulls are all sacrificed, along with the fat (Lev. 3:9–11). These nations sacrificed the Jews, so God used them for sacrifices. A year of recompense for the cause of Zion - NLT = "the year when Edom will be paid back for all it did to Israel" CSB = "a time of paying back Edom for its hostility against Zion." As the NLT paraphrases it Zion is taken as representative of the entire nation of Israel. Recompense means the act of compensating for service, loss, or injury. This divine payback is stated to be specifically for those who have opposed the cause of Zion. In other words, those people who have mistreated the nation of Israel, the apple of God's eye, will have their evil come back on their own head. The Anti-Semitic Gentile powers are going to be repaid for what they have done against Israel! Beloved, let me ask you -- Do you harbor any germ of Anti-Semitism in your heart? If you do, you need to confess it and repent and bring forth fruit in keeping with repentance such as praying for the peace of Jerusalem (Ps 122:6). McGee - This is the day of the Lord’s vengeance. We will see this again in Isaiah 63:1–6. You can’t do anything to stop it, just like there is nothing you can do to stop Niagara Falls from flowing. God says that things have to be made right upon this earth. To make them right He has to put down the evil and rebellious man upon this earth. Many people will not bow to God; but, since this is God’s universe, where will they go? He has only one place for them, which is called hell. You may have your own concept of it, but it undoubtedly is lots worse than a place of literal fire. God’s Word is inviolable and the Lord Jesus said, “Till heaven and earth pass, one jot or one tittle shall in no wise pass from the law, till all be fulfilled” (Matt. 5:18). My friend, it is wise to read the weather report and when a storm is forecast to make arrangements to escape it. Guzik - In this day of the Lord’s vengeance known as the great tribulation, there will be unparalleled ecological disaster. Before Jesus Christ returns at the end of the great tribulation, one-third of the earth’s vegetation, one-third of the oceans, and one-third of fresh waters will be destroyed and unusable (Revelation 8 and 16). Isaiah 34:9 Its streams will be turned into pitch, And its loose earth into brimstone, And its land will become burning pitch. KJV Isaiah 34:9 And the streams thereof shall be turned into pitch, and the dust thereof into brimstone, and the land thereof shall become burning pitch. Its streams will be turned into pitch - Turning running water to sticky tar-like material is the result of divine judgment. Matthew Henry - The streams thereof, that both watered the land and pleased and refreshed the inhabitants, shall now be turned into pitch, shall be congealed, shall look black, and shall move slowly, or not at all. Their floods to lazy streams of pitch shall turn; so Sir R. Blackmore. The dust thereof shall be turned into brimstone; so combustible has sin made their land that it shall take fire at the first spark of God’s wrath struck upon it; and, when it has taken fire, it shall become burning pitch; the fire shall be universal, not a house, or town, on fire, but a whole country; and it shall not be in the power of any to suppress or extinguish it. It shall burn continually, burn perpetually, and shall not be quenched night nor day (Isa 34:10). And its loose earth into brimstone - The former could be cultivated but not the latter. The language compares with that used to describe God's judgment and destruction of Sodom and Gomorrah (cf. Ge 19:24; Jer 49:17–18). And its land will become burning pitch - The picture here is a land like a smoldering volcanic wasteland. Pitch (02203) is zepheth means tar or pitch, a viscid substance used twice in this verse and elsewhere only in Exodus 2:3 "But when she could hide him no longer, she got him a wicker basket and covered it over with tar and pitch. Then she put the child into it and set it among the reeds by the bank of the Nile." Baker on zepheth - A feminine noun referring to tar, pitch. A bitumen, black, sticky substance used for waterproofing. The basket in which Moses was placed was waterproofed using this substance (Ex. 2:3). In figurative language, streams of Edom will be turned into pitch in a day of judgment (Isa. 34:9), indicating a hot flowing tar or pitch. Wikipedia - Pitch is a name for any of a number of viscoelastic polymers. Pitch can be natural or manufactured, derived from petroleum, coal tar or plants. Various forms of pitch may also be called tar, bitumen or asphalt. Pitch produced from plants is also known as resin. Some products made from plant resin are also known as rosin. Pitch was traditionally used to help caulk the seams of wooden sailing vessels (see shipbuilding). Pitch may also be used to waterproof wooden containers and in the making of torches. Petroleum-derived pitch is black in colour, hence the adjectival phrase, "pitch-black"
Constable - The prophet described Edom’s overthrow in terms reminiscent of the destruction of Sodom and Gomorrah (cf. Gen. 19:24–28; Deut. 29:23; Ps. 11:6; Jer. 49:18; Rev. 14:10–11), which lay in the same general direction as Edom from Jerusalem. Edom’s actions brought on this destruction. The world’s end will be total, and its territory will be uninhabitable from then on (cf. Lev. 6:13). Human sin affects humanity’s environment. ESV Study Bible feels that "Isaiah portrays hell (cf. Rev. 14:9–11) by means of expanding on the vision of the destruction of Jerusalem." Ironside has an interesting comment on Isaiah 34:9-15 - Next are described the desolations of the land of Edom, which apparently will continue throughout the entire millennial age as a reminder of the judgment of God meted out to a rebellious people, and thus as a warning to any who, even in the day of Jehovah’s power, might contemplate turning away in rebellion against the King reigning in Zion. Isaiah 34:10 It will not be quenched night or day; Its smoke will go up forever. From generation to generation it will be desolate; None will pass through it forever and ever. KJV Isaiah 34:10 It shall not be quenched night nor day; the smoke thereof shall go up for ever: from generation to generation it shall lie waste; none shall pass through it for ever and ever. Keil and Delitzsch - The one expression, “to contend for Zion,” is like a flash of lightning, throwing light upon the obscurity of prophecy, both backwards and forwards. A day and a year of judgment upon Edom (compare Isa. 61:2; 63:4) would do justice to Zion against its accusers and persecutors (rībh, vindicare, as in Isa. 51:22). The everlasting punishment which would fall upon it is depicted in figures and colours, suggested by the proximity of Edom to the Dead Sea, and the volcanic character of this mountainous country. The unquenchable fire (for which compare Isa. 66:24), and the eternally ascending smoke (cf., Rev. 19:3), prove that the end of all things is referred to. 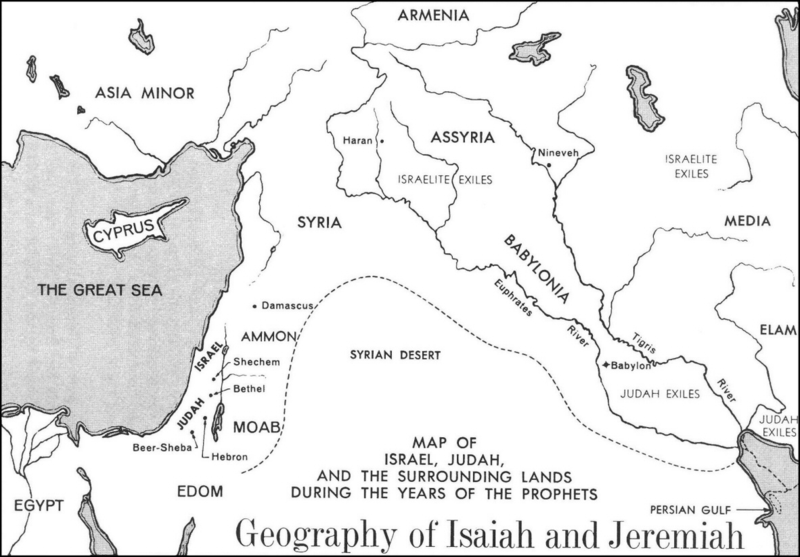 The prophet meant primarily, no doubt, that the punishment announced would fall upon the land of Edom, and within its geographical boundaries; but this particular punishment represented the punishment of all nations, and all men who were Edomitish in their feelings and conduct towards the congregation of Jehovah. It will not be quenched night or day; Its smoke will go up forever. From generation to generation it will be desolate - Matthew Henry comments "so combustible has sin made their land that it shall take fire at the first spark of God’s wrath struck upon it; and, when it has taken fire, it shall become burning pitch; the fire shall be universal, not a house, or town, on fire, but a whole country; and it shall not be in the power of any to suppress or extinguish it. It shall burn continually, burn perpetually, and shall not be quenched night nor day. The torment of those in hell, or that have a hell within them in their own consciences, is without interruption; the smoke of this fire goes up for ever. As long as there are provoking sinners on earth, from one generation to another, an increase of sinful men, to augment the fierce anger of the Lord (Nu 32:14), there will be a righteous God in heaven to punish them for it. And as long as a people keep up a succession of sinners God will have a succession of plagues for them; nor will any that fall under the wrath of God be ever able to recover themselves. It will be found, how light soever men make of it, that it is a fearful thing to fall into the hands of the living God (Hebrews 10:31-note). None will pass through it forever and ever - Henry "If the land be doomed to destruction, none shall pass through it, but travelers will choose rather to go a great way about than come within the smell of it." Isaiah 34:11 But pelican and hedgehog will possess it, And owl and raven will dwell in it; And He will stretch over it the line of desolation And the plumb line of emptiness. KJV Isaiah 34:11 But the cormorant and the bittern shall possess it; the owl also and the raven shall dwell in it: and he shall stretch out upon it the line of confusion, and the stones of emptiness. ESV Isaiah 34:11 But the hawk and the porcupine shall possess it, the owl and the raven shall dwell in it. He shall stretch the line of confusion over it, and the plumb line of emptiness. Keil and Delitzsch - The description of the ruin, which commences in verse 11a with a list of animals that frequent marshy and solitary regions, is similar to the one in Isa. 13:20–22; 14:23 (compare Zeph. 2:14, which is founded upon this). Isaiah’s was the original of all such pictures of ruin which we meet with in the later prophets. But pelican and hedgehog will possess it, And owl and raven will dwell in it - These were ceremonially unclean birds (cf. Dt 14:14–17), also associated with the ruins of Babylon (Isa 13:2) and Nineveh (Zeph 2:14). MacArthur adds that "The presence of unclean birds was a sign of desolation and wilderness. Similar symbolism portrays the final state of Babylon in the future (Rev 18:2; cf. 13:21; Jer 50:39; Zep 2:13, 14)." Matthew Henry on stretch over it the line of destruction - God shall mark them for ruin and destruction. He shall stretch out upon Bozrah the line of confusion with the stones or plummets of emptiness, v. 11. This intimates the equity of the sentence passed upon it; it is given according to the rules of justice and the exact agreeableness of the execution with the sentence; the destruction is not wrought at random, but by line and level. The confusion and emptiness that shall overspread the face of the whole country shall be like that of the whole earth when it was Tohu and Bohu (the very words here used)-without form and void. Gen. 1:2. Sin will soon turn a paradise into a chaos, and sully the beauty of the whole creation. When there is confusion there will soon be emptiness; but both are appointed by the Governor of the world, and in exact proportions. And He will stretch over it the line of desolation (formlessness) - ESV =. He shall stretch the line of confusion over it. This speaks of a desolate, empty waste and in a sense is a reversal of God's bringing order out of chaos, for the same two words desolation (tohu) and emptiness (bohu) are used in the creation account in Genesis 1:2. Line (06957)(qav) is a masculine noun which refers to a line for measuring and was literally a cord used in construction work (1 Ki 7:23). 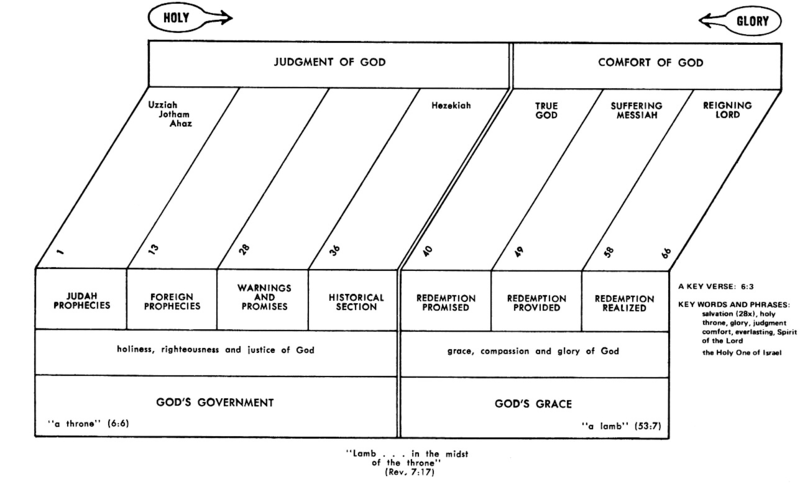 In the figurative sense qav refers to a measuring "line" or standard of justice (as applied to Jerusalem in 2 Ki 21:13). In David's psalm 19, qav refers to the "architectural plan" or line of the heavens reflecting the Master Craftman's handiwork (Ps 19:4). Qav can also refer to a word of instruction in prophetic or legal settings (Isa 28:10, 13). Finally, as in the present context qav can refer to God's judgments (Isa 34:11) and His sovereign distribution of power (Isa 34:17). Qav - 20x in 14v - circumference*(1), line(16), measuring line(3). NIDOTT says "Stretching a measuring line over the land means that as an ownerless plot of ground, the land is to be resurveyed and reassigned, the threat of judgment against Jerusalem is that the measuring line of Samaria will be cast over it (2 Kgs 21:13), meaning that it will be taken over by foreigners.The same sense in variant wording is found in Mic 2:4; the inheritance of the people will be surveyed with a measuring line. However, in the case of Edom the force of the picture has been escalated. The land can no longer be redivided because of the total destruction. The measuring line is one of תֹּהוּ, i.e., one useful only for absolute wasteland." And the plumb line of emptiness - God's measure of justice is meted out with absolute precision and perfection. These words tohu (formless) and bohu (void) first appear in Gen. 1:2, describing the world before God ordered it and filled it with life and now they describe the disorder as a result of His judgment! Desolation (08414)(tohu) means empty, formless, futile, waste, meaningless. Isaiah juxtaposes tohu and bohu (below) in the judgment against Edom to describe the total depopulation and destruction of the land so it is a waste fit only for desert animals. Baker - A masculine noun meaning formlessness, confusion. The exact meaning of this term is difficult at best since its study is limited to its relatively few Old Testament occurrences. It is used to describe primeval earth before the seven creative days (Gen. 1:2); a land reduced to primeval chaos and formlessness (Isa. 34:11; 45:18; Jer. 4:23); a destroyed city (Isa. 24:10); nothingness or empty space (Job 26:7); a barren wasteland (Deut. 32:10; Job 6:18; 12:24; Ps. 107:40); that which is vain and futile (1 Sam. 12:21; Isa. 45:19; 49:4); like idolatry (Isa. 41:29; 44:9); unfounded allegations (Isa. 29:21; 59:4); the nations compared to God (Isa. 40:17); or human rulers (Isa. 40:23). Although it is impossible to grasp the full import of this word, it is obvious that it has a negative and disparaging tone. It represents chaos, confusion, and disorder, all things that are opposed to the organization, direction, and order that God has demonstrated. Complete Word Study Dictionary – Old Testament. Tohu - 20x in 19v - chaos(1), confusion(1), desolation(1), emptiness(1), empty space(1), formless(2), futile(2), futile things(1), meaningless(2), meaningless arguments(1), nothing(2), waste(3), waste place(2). Emptiness (void)(0922)(bohu) means void or waste and depicts the state of matter after God had created it but before He had fashioned it for habitation (Gen. 1:2). It, therefore, describes the state of the land or earth after God judges it (Isa. 34:11; Jer. 4:23). It is used in combination with tōhû, without form, each time. Genesis 1:2 The earth was formless (tohu) and void (bohu), and darkness was over the surface of the deep, and the Spirit of God was moving over the surface of the waters. Jeremiah 4:23 I looked on the earth, and behold, it was formless (tohu) and void (bohu); And to the heavens, and they had no light. Theological Wordbook of the Old Testament. - It is probable that the descriptions in Isaiah of the desolations of Edom and those in Jeremiah of Israel borrow this phrase from the Genesis picture of a primordial chaos. Isaiah 34:12 Its nobles--there is no one there whom they may proclaim king-- and all its princes will be nothing. KJV Isaiah 34:12 They shall call the nobles thereof to the kingdom, but none shall be there, and all her princes shall be nothing. This describes a place barren of human life. NET - Her nobles will have nothing left to call a kingdom and all her officials will disappear. NLT - It will be called the Land of Nothing, and all its nobles will soon be gone. Matthew Henry - Their great men shall be all cut off, and none of them shall dare to appear: They shall call the nobles of the kingdom to take care of the arduous affairs which lie before them, but none shall be there to take this ruin under their hand, and all her princes, having the sad tidings brought them, shall be nothing, shall be at their wits' end, and not be able to stand them in stead, to shelter them from destruction. Isaiah 34:13 Thorns will come up in its fortified towers, Nettles and thistles in its fortified cities; It will also be a haunt of jackals And an abode of ostriches. KJV Isaiah 34:13 And thorns shall come up in her palaces, nettles and brambles in the fortresses thereof: and it shall be an habitation of dragons, and a court for owls. Beloved there is only one fortified tower and city which will stand forever. Are you safe in the Strong Tower of Jehovah Jesus by grace through faith? Matthew Henry - Even the houses of state, and those of strength, shall become as wildernesses (v. 13); not only grass shall grow, but thorns shall come up, in her palaces, nettles and brambles in the fortresses thereof, and there shall be none to cut them up or tread them down. We sometimes see ruined buildings thus overgrown with rubbish. It intimates that the place shall not only be uninhabited and unfrequented where a full court used to be kept, but that it shall be under the curse of God; for thorns and thistles were the production of the curse, Gen. 3:18. Isaiah 34:14 The desert creatures will meet with the wolves, The hairy goat also will cry to its kind; Yes, the night monster will settle there And will find herself a resting place. KJV Isaiah 34:14 The wild beasts of the desert shall also meet with the wild beasts of the island, and the satyr shall cry to his fellow; the screech owl also shall rest there, and find for herself a place of rest. And make this wilder place their home. Shall settle here their bloody colonies. Guzik - The Hebrew word for night creature is lilith, which is the feminine form of the word “night.” Old Jewish superstitions make Lilith a beautiful demon of the night, who seduced men and killed children. It is possible that Isaiah uses the term to describe the demonic habitation of Edom after God’s judgment. Night monster (03917)(lilith) is a feminine noun that describes a creature known for its main activity at night. KJV translates it here as "screech owl." Jamieson adds "in Jewish superstition a female, elegantly dressed, that carried off children by night. The text does not assert the existence of such objects of superstition, but describes the place as one which superstition would people with such beings." Wikipedia on Lilith - Lilith (Hebrew: לִילִית‎ Lîlîṯ) is a figure in Jewish mythology, developed earliest in the Babylonian Talmud (3rd to 5th centuries). Lilith is often envisioned as a dangerous demon of the night, who is sexually wanton, and who steals babies in the darkness The character is generally thought to derive in part from a historically far earlier class of female demons (lilītu) in ancient Mesopotamian religion, found in cuneiform texts of Sumer, the Akkadian Empire, Assyria, and Babylonia. Matthew Henry - There shall the screech-owl rest, a night-bird and an ominous one. Isaiah 34:15 The tree snake will make its nest and lay eggs there, And it will hatch and gather them under its protection. Yes, the hawks will be gathered there, Every one with its kind. The tree snake - This is a somewhat unusual translation and most versions interpret this as a reference to an owl's nest. Matthew Henry - the owl, a melancholy bird, the raven, a bird of prey, invited by the dead carcases, shall dwell there (with all the ill-boding monsters of the air, Sir R. B. ), all the unclean birds, which were not for the service of man, v. 13. It shall be a habitation for dragons, which are poisonous and hurtful. The great owl shall there make her nest (v. 15) and lay and hatch; the breed of them shall be kept up to provide heirs for this desolate place. The vultures which feast on carcasses, shall be gathered there, every one with his mate. Now observe, 1. How the places which men have deserted, and keep at a distance from, are proper receptacles for other animals, which the providence of God takes care of, and will not neglect. 2. Whom those resemble that are morose, unsociable, and unconversable, and affect a melancholy retirement; they are like these solitary creatures that take delight in desolations. 3. What a dismal change sin makes; it turns a fruitful land into barrenness, a frequented city into a wilderness. Or fold his circling spires to rest. KJV There shall the great owl make her nest, and lay, and hatch, and gather under her shadow: there shall the vultures also be gathered, every one with her mate. NET Owls will make nests and lay eggs there; they will hatch them and protect them. Yes, hawks will gather there, each with its mate. ESV There the owl nests and lays and hatches and gathers her young in her shadow; indeed, there the hawks are gathered, each one with her mate. NLT There the owl will make her nest and lay her eggs. She will hatch her young and cover them with her wings. And the buzzards will come, each one with its mate. Isaiah 34:16 Seek from the book of the LORD, and read: Not one of these will be missing; None will lack its mate. For His mouth has commanded, And His Spirit has gathered them. KJV Isaiah 34:16 Seek ye out of the book of the LORD, and read: no one of these shall fail, none shall want her mate: for my mouth it hath commanded, and his spirit it hath gathered them. Isaiah 30:8 (Now go, write it on a tablet before them And inscribe it on a scroll, That it may serve in the time to come As a witness forever. Not one of these will be missing These events will certainly come about because the Lord has decreed it. Edom’s destruction is coming just as the word of the Lord has declared (vv. 16–17). Matthew Henry - Here is an assurance given of the full accomplishment of this prediction, even to the most minute circumstance of it. When this destruction comes compare the event with the prediction, and you will find it to answer exactly.” Note, The book of the prophets is the book of the Lord, and we ought to consult it and converse with it as of divine origin and authority. We must not only read it, but see out of it, search into it, turn first to one text and then to another and compare them together. Abundance of useful knowledge might thus be extracted, by a diligent search, out of the scriptures, which cannot be got by a superficial reading of them. When you have read the prediction out of the book of the Lord then observe, 1. That according to what you have read so you see; not one of these shall fail (None will lack its mate For His mouth has commanded), either beast or fowl: and, it being foretold that they shall possess it from generation to generation, in order to that, that the species may be propagated ( And His Spirit has gathered them), none shall want her mate; these marks of desolation shall be fruitful, and multiply, and replenish the land. 2. That God’s mouth having commanded this direful muster His Spirit shall gather them, as the creatures by instinct were gathered to Adam to be named (Ge 2:19-20) and to Noah to be housed (Ge 7:1-3, 8-9). What God’s word has appointed His Spirit will effect and bring about, for no word of God shall fall to the ground. The word of God’s promise shall in like manner be accomplished by the operations of the Spirit. 3. That there is an exact order and proportion observed in the accomplishment of this threatening: He has cast the lot for these birds and beasts, so that each one shall know his place as readily as if it were marked by line. See the like, Joel 2:7, 8-note, They shall not break their ranks, neither shall one thrust another. For His mouth has commanded - What God commands, God completes (one way or another). What God command us as His Spirit filled children, God enables by His Spirit! Are you filled with the Spirit today (Eph 5:18-note)? One of the best ways is to be filled with His Word (and obey it cf James 1:22-note) (See Filled with His Spirit/Richly Indwelt with His Word). Then you will empowered to fight the good fight of faith and to keep His command to walk by the Spirit to successfully fight off the desires of the flesh (Gal 5:16-17-note). Guzik - This remarkable statement tells us that Isaiah understood that his words were the words of the LORD. It also tells us that Isaiah meant that his prophecy should be understood literally—poetically, but literally. It also means that Isaiah clearly challenged doubters to “look it up” once the prophecy was fulfilled.. “After Edom has become a wasteland, men will take out the scroll and verify that Isaiah’s predictions came true.” (Wolf) This time of great tribulation is certainly coming upon the earth. This is beyond all doubt; our part isn’t to bring it or to prevent it, but simply to be ready, and to pray always that you may be counted worthy to escape all these things that will come to pass, and to stand before the Son of Man (Luke 21:36). Isaiah 34:17 He has cast the lot for them, And His hand has divided it to them by line. They shall possess it forever; From generation to generation they will dwell in it. KJV Isaiah 34:17 And he hath cast the lot for them, and his hand hath divided it unto them by line: they shall possess it for ever, from generation to generation shall they dwell therein. They shall possess it - They is the fauna and the flora described in the previous verses. Forever from generation to generation they will dwell in it - The fauna and flora will have a perpetual presence in this desolated land. Matthew Henry - The soothsayers among the heathen foretold events by the flight of birds, as if the fate of men depended on them. But here we find that the flight of birds is under the direction of the God of Israel: He has cast the lot for them. That the desolation shall be perpetual: They shall possess it for ever. Constable - How does this picture of devastation so thorough that no human beings remain alive harmonize with other revelation concerning the Tribulation? According to Revelation 6:8 and 9:18 half of the world’s population will have perished by the end of the sixth trumpet judgment. Many more devastating judgments will fall on earth-dwellers after the sixth trumpet judgment, specifically the seven bowl judgments, the worst ones of all in the Tribulation. Therefore what Isaiah pictured may be what the earth will look like at the very end of the Tribulation, just before Jesus Christ returns to the earth. There will be some people left alive on the earth then, but Isaiah’s description was perhaps hyperbolic to make the point that God will judge all the earth’s inhabitants. MacArthur - God had partitioned off Edom just as He once did Canaan (Nu 26:55, 56; Jos 18:4–6) and allotted it to the wild animals listed in vv. 11–15. Jamieson - As conquerors apportion lands by lot, so Jehovah has appointed and marked out (“divided”) Edom for the wild beasts (Nu 26:55, 56; Jos 18:4–6).